Tom Landrum was responsible for managing the university’s advancement program, which included fundraising, alumni relations, financial and fundraising support services, donor relations and stewardship, special events, and career counseling. He has worked toward campaigns totaling over $1 billion. Before serving as vice president, Landrum worked 19 years in the office of the president. He was assistant to former President Charles Knapp and executive assistant to President Michael F. Adams. Landrum is co-advisor of the UGA Blue Key chapter, and a past vice chair of the national Blue Key board of directors. He is a recipient of the national Blue Key Honor Society’s Distinguished Service Award. He is a member of Phi Kappa Phi scholastic honorary society, the Grady College Board of Trust and the Grady Fellowship, a board member for the Wormsloe Institute for Environmental History, and a member of the Eagle Scout Association. 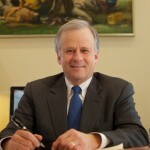 He is a former member of the board of directors of the Georgia Humanities Council. Landrum has a bachelor’s degree in history and a master’s in journalism from UGA and has worked at the university since 1976.